Fibrous Dysplasia is a bone disorder in which scar-like (fibrous) tissue grows in place of normal bone, weakening the bone, and often leading to deformity, fracture, and limb length discrepancy. 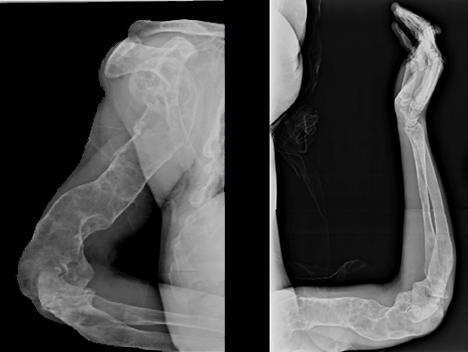 Fibrous Dysplasia can manifest as a multi-bone disorder or a single-bone disorder. The tumors are lytic lesions in the bone, frequently diaphyseal (in the shaft of the long bone). Viewed in a microscope, the bone in individuals with Fibrous Dysplasia appears like an “alphabet soup;” that is, the woven bone appears in the shape of different letters. The bone is relatively weak due to these lesions. The lytic lesions of Fibrous Dysplasia have the potential for malignant degeneration, especially in adulthood. This is a theoretical contraindication, therefore, to the use of bone morphogenic protein (BMP). When large lytic lesions occur, they are usually treated by bone grafting. Since the volume of bone graft requires greater than the amount available from autogenous donor sources, an allograft is typically used.